Karen Corrigan is Professor of Linguistics & English Language in the School of English Literature, Language & Linguistics. She is currently engaged in an 18-month project, “Múin Béarla do na Leanbháin” ‘Teach the Children English’: Migration as a Prism for Viewing Ethnolinguistic Vitality in Northern Ireland, looking at historical and contemporary migration to and from Northern Ireland within the ‘Connected Communities’ theme led by the Arts and Humanities Research Council. The project is a partnership between Newcastle University, The Mellon Centre for Migration Studies and Gael Linn. This blog post focuses on a recent public lecture delivered as part of Community Relations Week in Omagh, Northern Ireland. The lecture was the first of many events where Karen will engage with community members, educational providers and students, the heritage sector and the general public, ensuring that her research will have an impact beyond academic life. 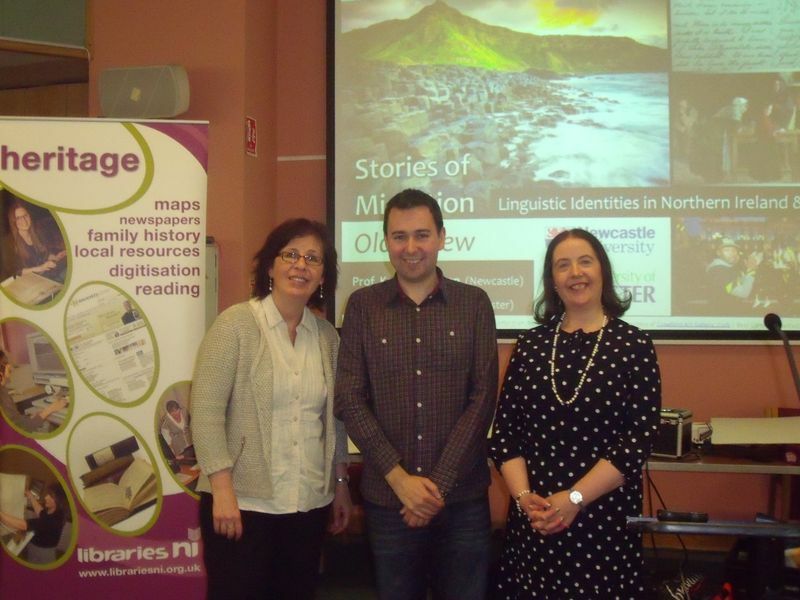 On 16 June 2014, Karen Corrigan and Dr Philip McDermott (University of Ulster) participated in Community Relations Week in Omagh, Northern Ireland, giving a public lecture entitled Stories of Migration Old and New: Linguistic Identities in Northern Ireland and Beyond. The talk was very well received by an enthusiastic audience who took the opportunity of the Q&A, at the end of the lecture, to explore notions of identity and diversity with the speakers and chair, Dr Johanne Devlin-Trew (University of Ulster and the Mellon Centre for Migration Studies). Feedback on the event at Omagh Public Library was gathered by Deirdre Nugent (Heritage Services Manager at Libraries, NI) and included the comment from one attendee that the talk “made me think about language diversity in our own community more” which demonstrated that the lecture not only achieved its main goal, but made an important contribution to the theme for Community Relations Week which was Building A United Community, matching the declared government strategy for social cohesion. One goal of their lecture was to discuss how migration has shaped the linguistic and cultural landscape of Northern Ireland, from Old Norse place names like Strangford to day-to-day vocabulary like scallion ‘spring onion’, which has Anglo-Norman roots, and words like geg ‘trick’, which is Scots. There are also many words that ultimately derive from the Celts who first settled the region in c.450BC, many of which are so established in Standard English that their roots as Irish Gaelic in origin is not widely known – like bog, galore, slogan and Tory. There are other words used in common parlance which, by contrast, remain stereotypically thought of as originating in Ireland such as brogue and craic. A second goal was to examine the cultural and linguistic contributions which migrants from Northern Ireland have made as a result of settling in large numbers abroad (particularly in the nineteenth century but even earlier too). Finally, the lecture explored the linguistic impact of contemporary migration to Northern Ireland as a result of the Peace Process of the 1990’s, examining materials from parents, children and educators collected during Philip’s doctoral dissertation and Karen’s new AHRC-funded project. Karen opened the talk with an exchange between two characters in a new play called Quietly written by Owen McCafferty. The setting is a Belfast pub now owned by Robert, a Polish immigrant. The play focuses on truth and reconciliation between the two main characters – Ian (a Protestant) and Jimmy (a Roman Catholic) who is the son of a man who Ian blew up in Robert’s pub back in 1974. This was at a time when the only ethnic differences that mattered were between Protestants and Catholics. The play focuses on Jimmy’s coming to terms with the past so he can begin adjusting to the present in which new cultural, linguistic and ethnic differences – like those epitomised in Robert’s character – influence Northern Irish society. Philip closed the talk with a famous quote from a 1998 book by Claire Kramsch entitled Language and Culture in which she argues that language has its own cultural value and that: “Speakers identify themselves and others through their use of language; they view their language as a symbol of social identity” (Kramsch, 1998: 3). For more information, visit the “Múin Béarla do na Leanbháin” ‘Teach the Children English’ project website. Much of the previous linguistic research in Northern Ireland has looked at language within the context of the religious divide; this project turns to newer migrant populations who have come to the region in greater numbers than before in the wake of the 2004 expansion of the European Union. The public lecture is an annual event organised by the Community Relations Council to celebrate the ethnic and cultural diversity of the region. In addition to the public lecture featured here, there were a wide variety of Community Relation Week events, including sports, exhibitions, musical and theatrical performances, workshops, and films. These events were hosted all across Northern Ireland, organised by volunteers, community groups, District Councils, libraries, and schools. This entry was posted in Uncategorized and tagged AHRC, Irish language, Karen Corrigan, migration, Northern Ireland by Angie. Bookmark the permalink.